Private Training | Mediterra - Swim & Run Better Than Ever! Enjoy a sensitive, personalized learning process, at your pace, for your goals. Acquire the peace, the understanding, the mental and the physical skills you need right now to take the next step forward toward your goal: removing fear, increasing ease, improving efficiency, speed or long distance swimming ability. You and your coach customizing the learning experience to fit your brain and body. In-water demonstrations, hands-on guidance, feedback and encouragement to super-charge your skill development. 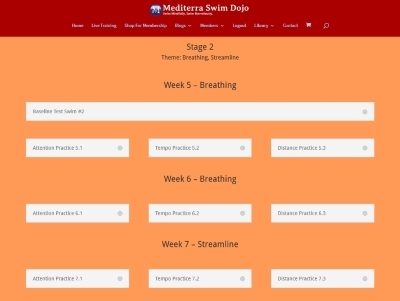 Access lesson notes, follow a training course, maintain a dialog with your coach, and study the abundant online training library with a 3-month membership to our Mediterra Swim Dojo. Thank you, Mat! As I was leaving last night I realized that you had hit the nail right on the head… our lesson focus last night is exactly the piece of the puzzle that I need to work on, and I didn’t know that going into our time. Your diagnostics are really acute and you were able to figure out what direction I needed to take. Thank you once again for your being so present when you teach! *The group should be composed of people of similar starting skill level. If in doubt, let’s discuss it. Family prices (for 3 or more parents and children) are available also. Please inquire for more details. We recommend a 90-minute session for your first couple lessons. There is a lot to cover and practice. Time goes by quickly. You may view Our Pricing Explained. For best learning, it would be preferable to schedule your first series of lessons within a 2-month time-frame. Extensions may be considered for difficult circumstances. We recommend a 90-minute session for your first couple. There is a lot to cover and practice. Time goes by quickly. Some early mornings are available 5:00 am to 7:00. Monday, Wednesday, Friday mornings 9:00 to 12:00. Tuesdays, Thursdays and Saturday after 11:00 am. Mondays and Wednesdays between 9:00 to 14:00. Tuesdays and Thursdays between 14:00 to 18:00. We are sad to announce that Turtles Yoga in Beaverton has closed as of March 1, so we are no longer using that pool for our lessons. We are working urgently on find a new pool location in the Portland Metro area. Contact us if you have any questions or you have a contact at a pool you believe to be suitable for our kind of services. We are continuing to offer full swim services in Salem at five location of the Courthouse Club Fitness network, with openings 7 days a week, 14 hours a day. If it works for you to drive down to Salem, we are glad to work with you there, until we have a new location in Portland. Our principle-based learning method will guide your body into the safest, strongest, longest lasting movement patterns for swimming. These activities will strengthen attention in the mind, and improve control over the body. You will acquire an improved relationship with your body and with the water. We will start with drills then emphasize whole-stroke practice with focal points to help you imprint new skills. Introduction to the the skills, the relevant focal points, and the drills we may use. In-water demonstration, hands-on correction and feedback from the instructor. You may read more about how we organize the progression of skills and training on our Levels Of Proficiency page. It is important to your progress that you practice on your own between lessons, at least once, if not two or three times. Please hold off on scheduling lessons until you have room in your schedule to include those personal practice times between. They don’t need to be long practice sessions, but frequent practice will be very good for you. You may want to view Your Training Progression to get an idea of how to get the most out of your training with Mediterra. You may view the Levels Of Proficiency to see which skills you may want to work on first.